Fire blight is a challenging bacterial pathogen on its own, but with so many factors that could contribute to a flare-up and how little of the pathogen is necessary to infect entire orchard blocks, it’s really no surprise there were outbreaks this year in some parts of the country including in Washington. If you had fire blight in your apple orchard this year, it’s safe to say your approach to 2019 needs to change. Not only that, it’s safe to say that the pathogen is present in your orchard. So, it’s no longer a time for prevention; it’s time for defense. And, leading plant pathologists and Extension educators around the country will help you to understand your risk and how best to prepare your orchards for the start of the 2019 growing season. The most important thing to do is to get as much of the fire blight cankers out of the orchard, because while the pathogen isn’t active in the cold, it does overwinter in cankers. “I find generally, the larger the branches get, the more likely the pathogen will survive,” says George Sundin, Professor of Plant Pathology at Michigan State University. Now’s a good time to scout and remove cankers. Limbs with fire blight strikes will have the tell-tale Shepherd’s crook and may be the last limbs to defoliate. “There will probably still be a couple of leaves on trees, particularly the fire blight ones. Those leaves are solid because those branches are dead,” says Kerik Cox, Associate Professor of Plant Pathology at Cornell University. Cox says it’s OK to leave the small wood in the row middles to dry out. But, if you live in a region that is wet, you may want to move the small wood out of the orchard. The wood you removed in the fall can be swept up and chopped, as soon as the tractor can drive through the orchard in the spring to help facilitate degradation. “It probably won’t hurt if you’re in one of those regions with apple scab and other gross things on the ground – that an additional spray of urea for apple scab in early spring will only help accelerate the degradation of any limbs and junk you might have left over from winter pruning that could have fire blight,” Cox adds. 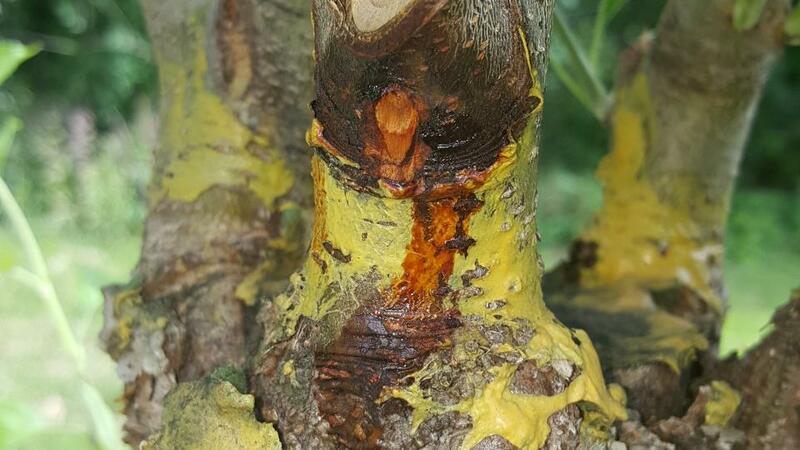 Acimovic says it may be helpful to have an Extension educator come to the orchard and work with your crews to identify, flag, and remove the cankers. Cankers on small branches can be quite tricky to spot and remove. In younger orchards, now’s also a good time to see signs of rootstock blight, trees where fire blight has traveled to the roots and is killing the tree. Look for trees that turn purple early and have ooze or dead tissue in the rootstock. Winter — when there are grower-meetings — can also be a good time to talk about what happened on your orchard, especially to your neighbors. David Granatstein, Sustainable Agriculture Specialist Emeritus at WSU, likens this to how growers banded together for area-wide management of codling moth. 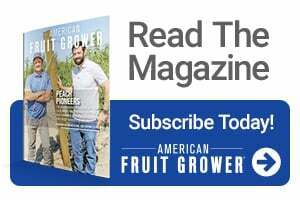 “Growers need to be communicating across fence lines because they may not have seen anything in their orchard, and if their neighbor’s block has a bunch of fire blight, they really need to know that for their own management decisions,” he says. As your orchard comes out of dormancy and spring nears, don’t assume your work is done. In fact, it’s just getting started. “If you’ve had fire blight in the orchard in either of the two previous seasons there’s a good chance the pathogen is in there,” Sundin says. At silver tip, apply a big full rate of copper, too. 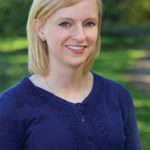 “That will protect against any oozing cankers and any oozing fire blight that starts once the trees [start] pushing again,” Cox says. Lime sulfur — used as a thinning spray — can be an added tool to your arsenal, especially if you are an organic grower. There is some concern about phytotoxicity with lime sulfur sprays, but Johnson says the risk is higher at petal fall than in early bloom treatments. And it’s also cultivar and species-specific. “Apples are less likely to be injured by lime sulfur than pears, and red apples are more tolerant than yellow apples. Lime sulfur at petal fall has value for blight control in some situations, such as organically-managed red apples,” he says. Johnson says it’s critical to have enough spray equipment to cover all rows of susceptible blocks every three days. It’s also important to follow disease models like Maryblyt and Cougarblight to determine when blocks are at the most risk and when to spray. And Johnson says that just because you’ve made it through petal fall, does not mean your risk for infection is over. “Based on when the pathogen is most abundant, petal fall and the week after is likely when most infections occur,” he says. 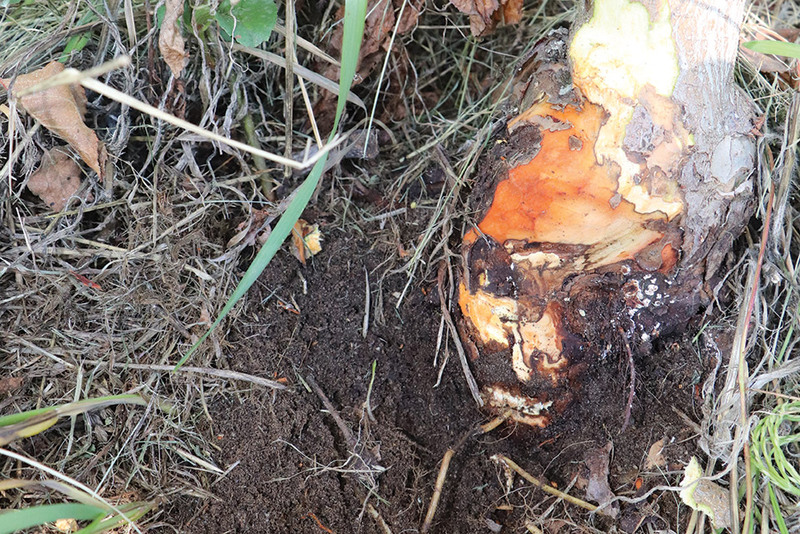 A zero-tolerance to fire blight strikes in young high-density orchards is almost a given. It’s crucial to take an inventory of your damage. If your damage is higher than 40% or 50%, it’s time to replace the orchard. And, you may need to weigh the use of a plant growth regulator — or PGR — to help slow down that growth to prevent shoot blight. 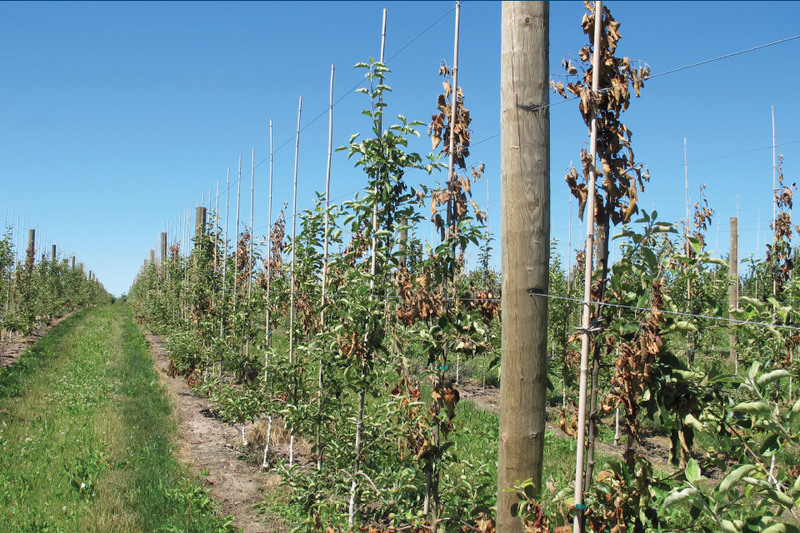 “No one wants to use Apogee in a young orchard, however, it can save young trees in a high-inoculum situation,” says Sundin. And, it is necessary in mature orchards to prevent infections on shoots from taking off. “When you apply it, you’re trying to rescue your investment in a mature tree that you grew for years,” Acimovic says. “On mature trees, Apogee is reducing the possibility for new fire blight cankers to form on wood from infected shoots. It is also buying you time by slowing down growth to allow pruning crews in to prune out the infected parts.”The other critical element is to shift your fire blight management strategy from prevention to protection. High-density orchards are problematic for fire blight control, as trees are planted closer and closer, so inoculum can be spread easier, and there’s less permanent wood to withstand strikes. Growers also push trees to reach the top wire, and all that nutrition is also quite beneficial for the fire blight pathogen. 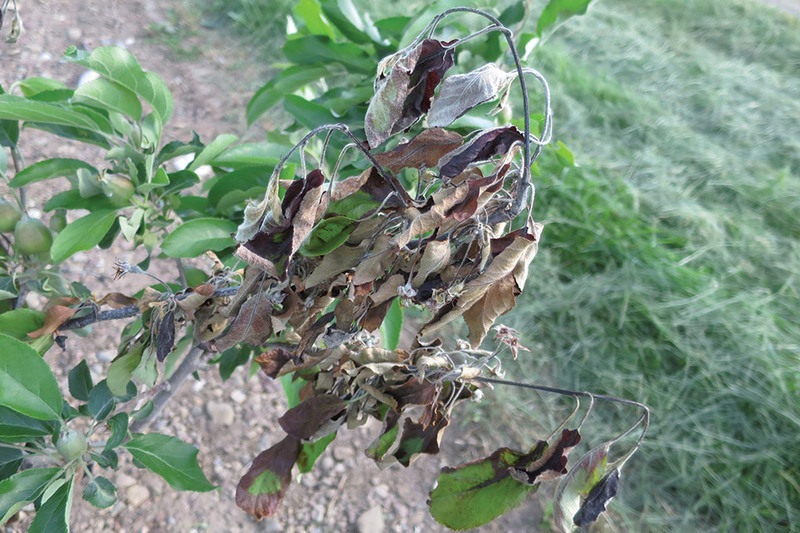 As growers shift from central leader systems to high-density, tall spindle V-systems, or super spindle plantings, the risks for fire blight outbreaks increase incrementally. There’s just less permanent wood to withstand strikes. And, growers tend to push trees to reach the top wire, and all that nutrition is also quite beneficial for the fire blight pathogen. Next to flowers, green tissue is the most at-risk for infections. Hard cider varieties are also very susceptible to fire blight infections, and it may be worthwhile to graft them on rootstocks that have resistance to the fire blight pathogen such as the Geneva series. And, don’t forget your new plantings this spring. New trees tend to bloom later than your other blocks that you’ve treated, which can be as early as May and as late as July. David Granatstein, Sustainable Agriculture Specialist Emeritus at Washington State University likens this increased risk to a change in varieties that are in favor with consumers, and adding to that a robust nutritional program and there’s more risk for fire blight flare-ups.“Our fleet is not as rustproof as it used to be, perhaps, and all these susceptible varieties packed together on hundreds and hundreds of acres now, pushed to the max with nitrogen and it’s an overall recipe for more problems,” he says.